Combining our best-selling strains in one packet, the Pop Culture mixpack is proving to be very popular and in high demand. Three strains, offering a variety of flavors and aroma’s, perfect for growers of all levels of experience. Enjoy strong, ‘couch-locking’ sensations and soaring, euphoric highs, offering recreational pleasure and several medicinal applications. Quality and quantity go hand-in-hand with this collection, with each of the three strains feminized and guaranteed to germinate. Once planted, the seeds will generate strong, female plants with potent buds and large yields. A perfect choice for all levels of experience and expertise, providing a high quality harvest grown either indoors, or outside in a warm, sunny climate. Skywalker OG – An Indica dominant Kush with a potent ‘Dark Side’. 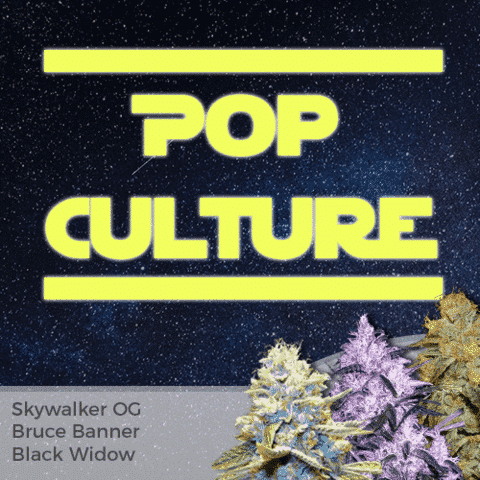 Bruce Banner – Large pungent buds with a high THC content and sweet strawberry flavor. Black Widow – A potent and easy growing ‘White Widow’ variety with darker buds and up to 25% THC content. Enjoy strong, ‘couch-locking’ sensations and soaring, euphoric highs.